Having only just reviewed the Sprinkles ATM a few months ago, I was shocked to discover yet another new addition to the Sprinkles portfolio. 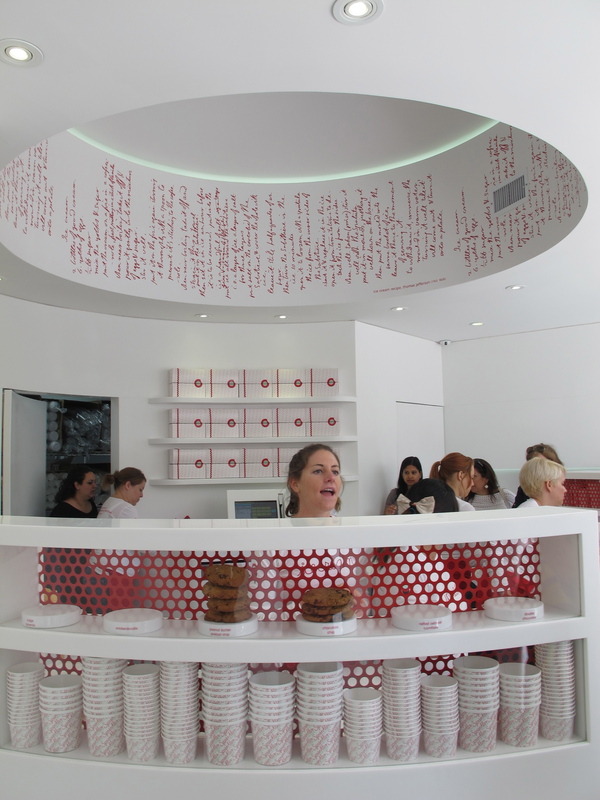 ‘Ice Cream’ is the latest sweet tooth’s dream on Beverly Blvd. The grand opening was yesterday so I anticipated a long line but was pleasantly surprised to see it wasn’t overly busy. 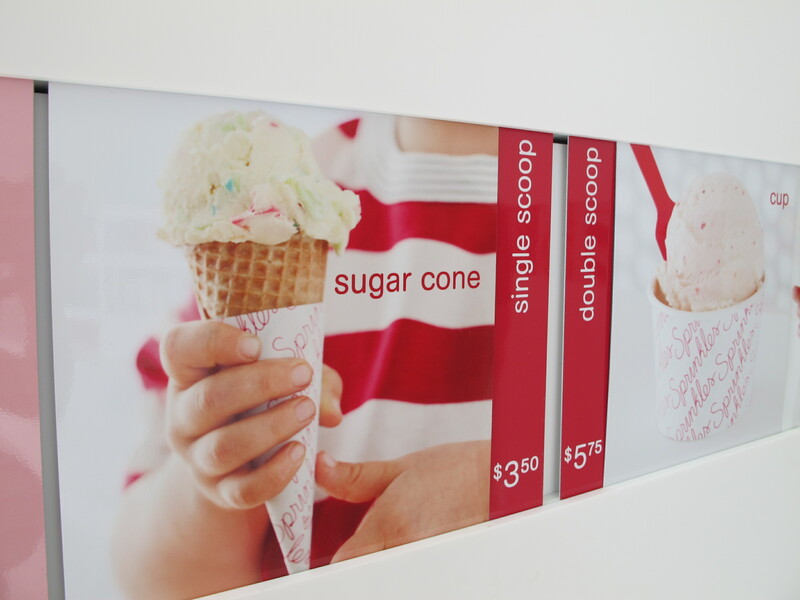 Entering a white room I saw the ice cream and topping choices listed on the wall beside me. The inside is certainly attractive (in true Sprinkles style) with red calligraphy scribble style writing on the ceiling. The only negative about the appearance is the menu placement which seems awkward in its positioning. When a line forms inside it’s hard to see the options because they aren’t written anywhere else in the building, just on the side wall as you enter. Sprinkles ice cream is handcrafted using Straus organic dairy and i’m told the flavor options vary daily. This particular trip the options were: Red Velvet, Chocolate Chip, Butter Pecan, Vanilla Bean, Coffee Fudge Almond, Pistachio, Dark Chocolate, Cherry Vanilla, Mint Chip, Peanut Butter Cup, Rocky Road and Strawberry sorbet…WOWZA! That’s a lot of choices. They only allow two tasters, so be sure to choose wisely! I tasted the Butter Pecan first and although it was good, it wasn’t like a traditional butter pecan that i’m used to. The pieces had a saltiness to it that I quite liked but although it was tasty, I just wasn’t in the mood for a full cup. My second taste was the classic Red Velvet, which was so good I decided to go for it as my ice cream of choice. I went all out and had it in a red velvet cone to match too! The cone was great and had a very sweet and rich chocolate flavor. The ice cream is slow churned to incorporate less air which results in a densely creamy dessert. Having said that it did seem like a simple vanilla base and not a cream cheese flavor (which I think would have been more unique). The main feature were the delicious chunks of sprinkles red velvet cake which were moist, rich and delicious. The toppings and sauces available include Hot Fudge, Salted butterscotch and Marshmallow Cream to name a few. There are also Cookies, Ice cream sandwiches and options to buy a ‘Pint for later’. As summer is quickly approaching I can see this new addition to the Sprinkles family becoming another huge success. What I tried was certainly good, but I have to say the main appeal of the flavor I chose were the pieces of cake within it which made me think…I should just go to Sprinkles and get a cupcake! Seeing as it was just next door, that’s exactly what I did. I’m sure I will return to Ice Cream to try other flavors in future, but I have to say that the original Sprinkles Cupcakes will always have my heart!